Shellder in game: 2,300 Who? Important notice! 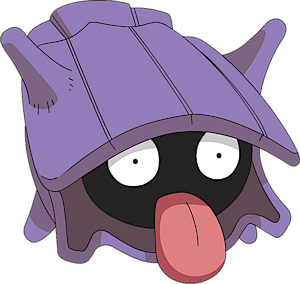 Pokemon Shellder is a fictional character of humans. 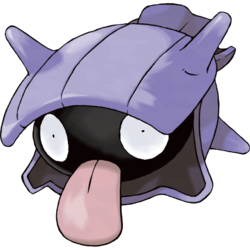 Shellder is a black pearl-like Pokémon encased within a spiky, blue-violet bivalve shell. It has two round white eyes with tiny black pupils. It has an enormously long red tongue, which it uses to burrow itself into sand and to lure and capture prey. Its body is known to be soft and tender; however, its shell is said to be harder than diamond. Prehistoric Shellder were apparently preyed upon by Omastar. Once ensnared by Omastar's tentacles, its hard shell stood no match to the Spiral Pokémon's deadly powerful bite, and its soft insides quickly devoured. Shellder can develop a symbiotic relationship with Slowpoke. After attaching itself to the Dopey Pokémon's tail, the two undergo a metamorphosis and together evolve into Slowbro. If it attaches to the head of a Slowpoke in possession of a King's Rock, the two will instead evolve into Slowking. These relationships allow it to travel onto land and obtain a new stage in its life cycle. While in its crown form, Shellder will periodically release its venom into Slowking's brain. This is actually beneficial to Slowking, as it causes the Regal Pokémon's intelligence to increase. Higher quantities of venom intensify this effect, and Shellder is easily provoked into releasing more whenever Slowking yawns. Shellder has two former signature moves. It can shoot spears of ice by using Icicle Spear, or clamp tightly to its opponents using Clamp. Despite its hard shell, clamping on to an opponent will reveal its vulnerable parts. Because of this, it will only clamp itself to a foe as a last resort. It swims around its sea floor home by rapidly opening and closing its shell while facing backward. For a list of Shellder's appearances in the anime as part of Slowbro or Slowking, see the anime sections of Slowbro and Slowking. Jessie captured a Shellder in The Evolution Solution. 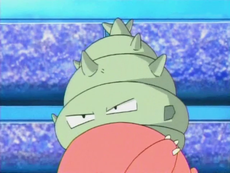 Later in the episode, it bit on a Slowpoke's tail, making it evolve into a Slowbro and leaving Team Rocket. A Shellder also appeared in Battling a Cute Drama! under the ownership of Marilyn. Shellder's first appearance was as part of a Slowbro in Island of the Giant Pokémon. Multiple Shellder appeared in The Misty Mermaid under the ownership of the Sensational Sisters. One reappeared in Cerulean Blues. A sick Shellder was treated by Nurse Joy in The Joy of Pokémon. Multiple Shellder also appeared in The Power of One and Going for the Gold!. A Shellder living in the ocean surrounding Shamouti Island appeared in Slowking's Day. A Shellder was one of the Pokémon living at Temacu's father's lab in The Heartbreak of Brock. Three Shellder appeared in Mantine Overboard! living underwater. A Trainer's Shellder went up against Ash's Totodile in Octillery The Outcast during a qualifying match for the Whirl Cup and lost. In A Parent Trapped!, a Shellder was living underwater. Pryce of Mahogany Town owns multiple Shellder in Nice Pryce Baby. A Shellder bit a Slowpoke's tail, evolving it in the process, in Enlighten Up!. A Coordinator's Shellder appeared in Old Rivals, New Tricks! participating in the Sandalstraw Contest. A Shellder appeared in SM005, during a fantasy. A Shellder appeared in SM012, when Sophocles went to explore a Shellder for a class assignment. In Karate Machop! 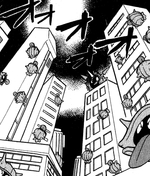 in Pokémon Adventures, Lorelei owns several Shellder. These Shellder were sent to attack Kanto alongside several other Elite Four Pokémon. In The Last Battle XIII a Shellder was one of the Pokémon sent to help the fight in Ilex Forest. Misty threw a Shellder at Ash after he was constantly staring at her in her swimsuit.